My problem was always hair straightening. There was a time when I didn’t put away hair straightener, but it worsen condition of my hair greatly. Today, I try to limit heat stylisation and use more oils for improvement of condition of my hair. I couldn’t resist though to test new products for hair stylisation, i.e. straightening brushes. Let me introduce to you my comparison of two devices – Braun Satin Hair and its cheaper equivalent, i.e. brush from Acevivi. 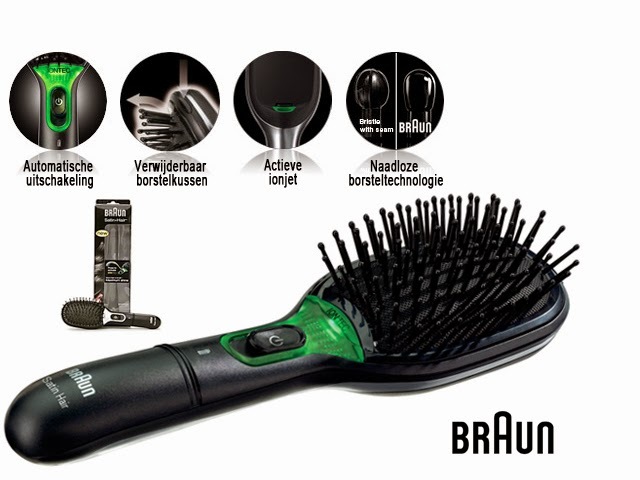 This straightening brush is advertised by Braun as a revolutionary solution for hair care of wild hair. Braun Satin Hair should give an instant gloss and smoother, thanks to technology of active ions – and it really works. 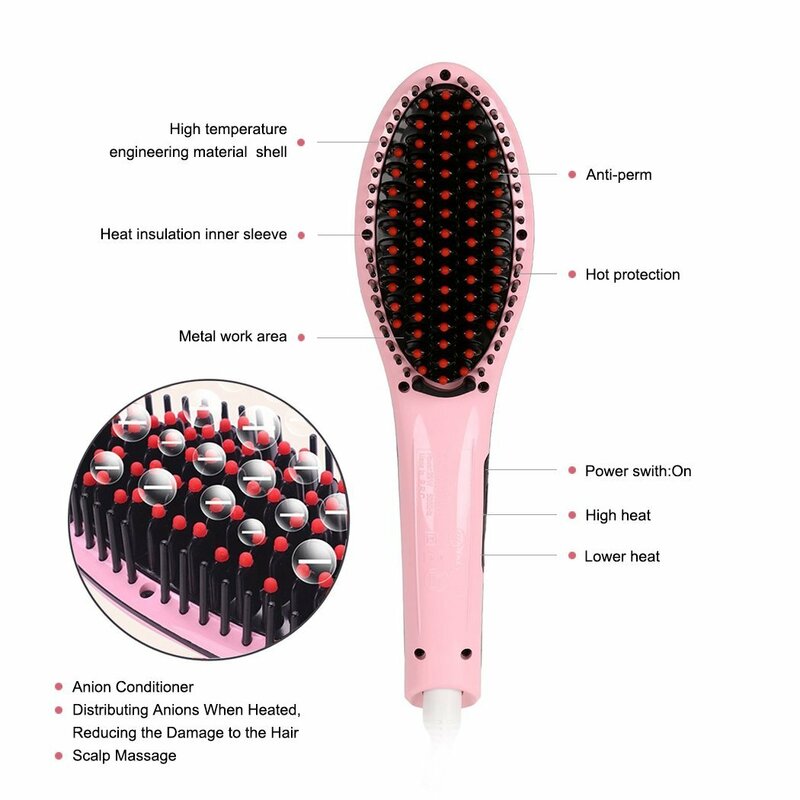 Straightening hair brush very thoroughly brushes out hair (and mine are curly and tangled), and thanks to removable cushion pad with natural bristle, like in standard hair brushes, use of Braun Satin Hair is trouble free and easy in clean. The on button is placed in a very accessible place, so it doesn’t go in a way of comfortable grip. What are the results of Braun Satin Hair use? Hair brush out like with normal brush, however the effect is much better. The streak of hair, which gets through the brush bristle is smooth and glossy. Curly streaks become more straight and don’t frizz and I felt afterwards like after the visit at the hairdresser’s. I didn’t expect from electric brush to give better effect than straightener and even without a hot air. Straightening hair brush from Acevivi rules on every Chinese purchase sites. Its popularity comes from very affordable price, and that is a reason why I also decided to try it. Acevivi offers brush with regulation of temperature, which has much tighter bristle than in regular brush. Acevivi brush lies in hand very comfortably, though its placement of buttons is wrong – during usage it is easy to accidentally change temperature or to turn it off. How does Acevivi brush work? In its properties this brush resembles standard straighteners, which smoother streaks through high temperature, not because of active ions or similar technologies, which don’t damage hair. The use of brush is much more difficult, because tight bristle won’t allow free brushing, and because of that Acevivi pulls out hair. What is truly sad, in my opinion, is that the effect of straight hair isn’t that great – hair don’t curl or frizz, but they are unnaturally matt and dry, and the effect is very short. Basic difference between Braun Satin Hair and straightening brush from Acevivi is their price – first brush is much more expensive than its Chinese equivalent. It is not a secret that this difference is justified, because straightening hair brush from Braun works much better, doesn’t damage hair and effect is truly long lasting. Braun Satin Hair 7 will handle even wild hair, and Acevivi is rather a device for people with thinner hair who wants fast straightening of slightly wavy hair.